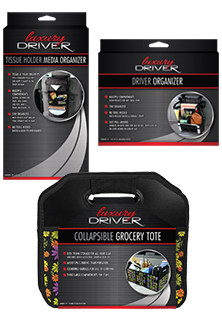 We Offer The Top Of The Line Brand Of Car Organizers “Luxury Driver”Car Organizers. High Quality Durable And Modern Design Car Organizers Will Increase Your Sales And Your Profits, Check Out Our Driver Organizers, Trunk Organizers, Back Seat Organizers, Media Organizers, CD Cases, Toll Pass Holders, And Insurance, Car Registration Wallets. Best Prices In The Nation Guaranteed! !